Portsmouth Times Reports on Stadium Construction and and Field Preparations for Opening Game (26 August 1930). The Portsmouth Times newspaper provided extensive coverage of the construction of what became known as Spartan Municipal Stadium. 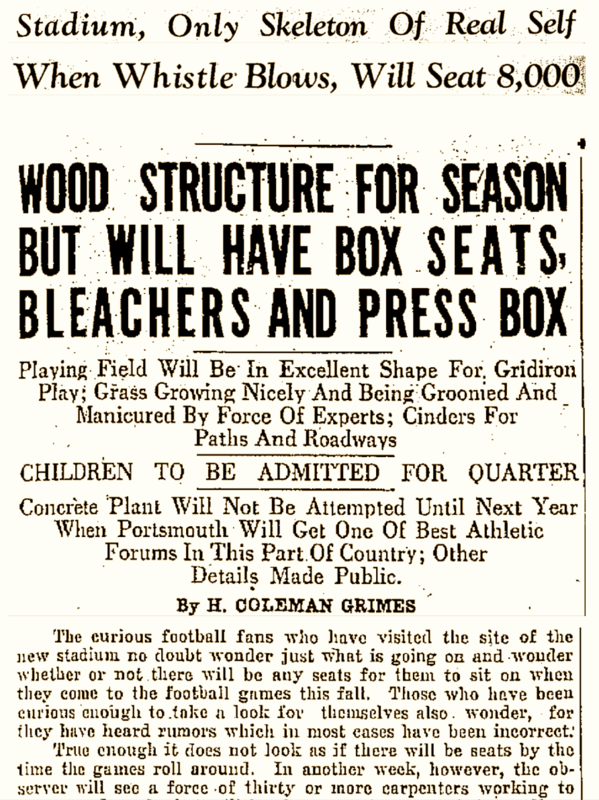 Here H. Coleman Grimes reports on delays in the pouring of concrete and the preparation of temporary structures for the Spartan's first NFL season. The Times also details the conditioning of the grass turf, plans for night games, a speaker system for play-by-play commentary, parking, and a special section for inexpensive children's tickets. Stadium, Only Skeleton of Real Self When Whistle Blows, Will Seat 8,000. The curious football fans who have visited the site of the new stadium no doubt wonder just what is going on and wonder whether or not there will be any seats for them to sit on when they come to the football games this fall. Those who have been curious enough to take a look for themselves also wonder, for they have heard rumors which in most cases have been incorrect. True enough it does not look as if there will be seats by the time the games roll around. In another week, however, the observer will see a force of thirty or more carpenters working to erect stands and what will be the superstructure of the stadium. There will be little concrete poured on the stadium this season. The delay which the company encountered in securing a lease and making other arrangements delayed the beginning of the stadium and it will be impossible to complete it before the opening of the football season. The only concrete that will be poured will be in the box seats and for the footers. Twenty tiers of wood stands will be so erected that the super-structure will be turned into forms for pouring the concrete. No more concrete will be poured this year after the opening of the football season as it would not be convenient for workmen to go ahead with the building of the structure between games. Next spring, with the breaking up of the frost, work will be started again and the stadium will be completed as originally planned. Ten more tiers of seats will be added and permanent stands of concrete will be erected. Baseball diamonds and a track oval will be built. The stadium this season will be of wood construction. There will be 21 boxes, complete and 20 tiers of seats. The seats will hold 4,200 people and the boxes will hold 300. Fifteen boxes will contain 14 seats and six will contain 12 seats. The stadium will be built on the west side of the field. Bleachers on the east side of the field this year will seat 3,500 people. The bleachers are the same stands that were used last season. This will give a total of 8,000 seats for this season. Needless to say, the playing field will run north and south as it always has. The south end of the field will be enclosed and will be reserved for children. Youngsters up to 14 years of age will be admitted to all games for twenty-five cents. An attempt will be made to "corner" the youngsters in this space reserved for them. They will be kept from running over the playing field either before the games or during intermission between halves, if possible. What they do in their own rooting section within reason, is up to them. Going back to the stadium, rest rooms will be proved in the rear of the structure. Temporary dressing rooms providing showers, lockers, rub down tables and the like, are being built for the Spartans and the Trojans and for all visiting teams. These will be made permanent next season. Large concession booths will be built at the north end of the field. These concessions will handle all kinds of soft drinks and edibles. They will be the most complete concession stand of their type in this part of the country. The seats in the stadium will be as comfortable as any in any stadium and the chairs in the boxes will be the next thing to lounging chairs. A commodious press box will be built at the top of the stadium for the convenience of newspapermen. The press box will be covered and equipped with chairs and tables. The press box this year will be more or less temporary as it will be moved several feet higher next year when the stadium is completed. Entrance to the field will be at the north end. There will be three turn-stiles to take care of the crowds and large exits will be thrown open at the end of games so that crowds can get out easily and quickly. Cinder walks are being built all over the field so that there will be absolutely no necessity of any person stepping in mud or slush. They are being built, several of them, from the street to the field and all along the inside of the field and stadium proper. Ample free parking space for automobiles will be provided this year and attendants will be on hand to watch automobiles and direct parking and traffic so that there will be no congestion. Automobiles can be let in and out of the field within a short time. There will be no necessity for anyone to park their automobiles on the streets outside of the field. The stadium will be known as the Portsmouth Universal Stadium, owned and operated by the Universal Stadium Company. In choosing a name for the new athletic structure the company said that the name is what it implies. It is open to everyone and every kind and type of athletic amusement will be provided in the seasons to come. It is "Universal." A great deal of speculation has resulted as to what condition the field will be in for playing purposes. The company built a new football field, leveled it and undermined it with tile for proper draining facilities. Seed specialists and caretakers of some of the best known football fields in the country were consulted before planing seed. It was necessary to plant seed that would grow quickly and provide a thick carpet of grass. The market was scoured for the best that money could buy. A half ton of seed was planted two weeks ago and already the grass is more than an inch high. By the time of the first game the grass will be ready for at least one cutting and will make the turf firm and solid for the hard use it will have during the season. Special care must be taken of the grass if the field is to be kept in the best of condition. A field cover of the latest design will probably be purchased by the stadium management to cover the field when not in use and keep it dry at all times. This will give the players a fast field at all times which insures fast football. An address system is being installed so that the spectators will be kept informed throughout football games as to substitutions, penalties, and a running account of the game. The announcing can be heard clearly all over the stadium and he will provide the information that a fan usually has to dig through a program or rule book to discover and then is dubious. This will also aid the inexperienced fan and help him to become better acquainted with the fine points of the game as the game is being played. Lights of the latest design will be erected for night football. This will be something new to the Portsmouth fans but night football has proven such a success in other cities that the management decided to install a plant here. The lighting plant will not be finished until September 16. Some of the games booked by the Spartans and the Trojans will be played at night. The lights are placed on poles forty feet apart in front of the stadium. The field will be flooded with light and engineers claim that the game can be seen better than in the daytime. An eight-foot board fence will be constructed all around the field. The company declares that the fence will enclose the finest football field in this section of the country within another year. A large booster program will be issued by the stadium company before the first football game which will tell of all the events in the stadium this season. The merchants of the city are cooperating with the stadium company in making the program a masterpiece in announcing the openings of the stadium and athletic field.